Connect your Stitchex product SKUs to your WooCommerce variants to sell available inventory online. Jump-start your WooCommerce product setup by uploading basic product, variant and SKU data from Stitchex to WooCommerce. Automatically sync your Available To Sell (ATS) inventory levels from Stitchex to WooCommerce as a result of updates within your Stitchex account. Reduce your inventory counts in Stitchex as a result of new orders on your WooCommerce store. 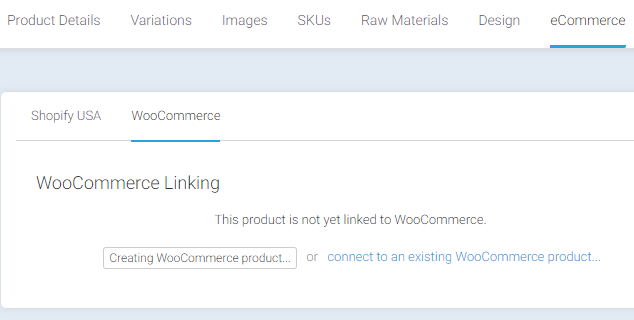 After connecting your Stitchex account to your WooCommerce store, you'll have the option to link your Stitchex product SKUs to WooCommerce variants. For products in Stitchex and WooCommerce that are "linked" the inventory levels in WooCommerce can be kept up-to-date with inventory levels in Stitchex, allowing you to sell your excess inventory through your online store. Stitchex also monitors sales that are made on your WooCommerce store to reduce inventory levels in Stitchex appropriately. As you work withing your Stitchex account, inventory levels are constantly monitored and any changes are immediately synced to your WooCommerce account. Stitchex watches for new orders on your WooCommerce store and immediately adjustments inventory downwards for ordered products. Your "in stock" inventory levels in Stitchex will reduce and consequently the "available to sell from stock" level will also reduce. You'll also be able to see a "WooCommerce Order" grouped inventory adjustment on the Update Inventory page, as well as individual (SKU level) adjustments in the inventory change log. 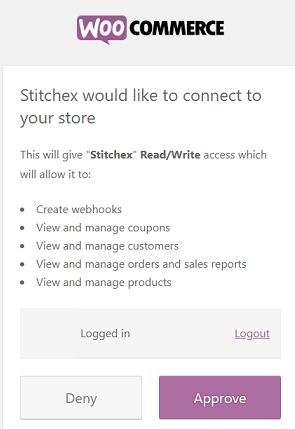 You can manage the connection between your Stitchex account and your WooCommerce store from the WooCommerce integration page within Stitchex. Navigate to the WooCommerce integration settings page. Click the "Connect to WooCommerce..." button. You will be redirected to WooCommerce pages - follow their on-screen instructions. Now that your Stitchex account is connected to your WooCommerce store, you can proceed to link your products so that Stitchex knows how to keep ATS inventory levels in sync. If you use Stitchex to quickly upload a new product to WooCommerce, prices for the product will be taken from this channel. This settings is not involved in the automatic update of inventory levels. 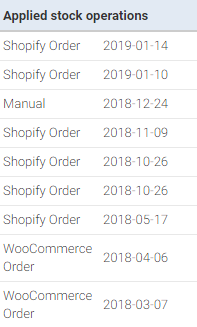 This is the quantity level to sync to WooCommerce. Usually, you will want to leave this as the default setting, "Available to sell from stock" (described above). 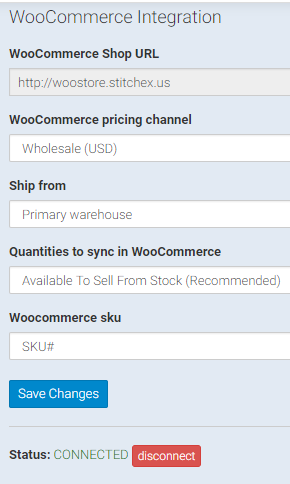 If you want to allow online customers to purchase units of inventory destined for your wholesale orders, you can change this setting to "In stock" which will sync your basic in-stock inventory levels to WooCommerce. You should bear in mind that you may have a shortfall when you come to ship your wholesale orders, and it will then be up to you to cancel any "oversold" units from those wholesale orders before shipping. Stitchex will only keep inventory levels in sync for Stitchex SKUs that are "linked" to WooCommerce product variants. You can link up existing Stitchex products to WooCommerce product or, if it's a new product that you haven't yet entered manually into WooCommerce, you can upload the basic product details from Stitchex to WooCommerce. Both of these operations can be accomplished by navigating to the product details page and clicking the "WooCommerce" button at the top of the page. Each Stitchex product variation can be linked to a particular WooCommerce product. If you have several products in your WooCommerce store that are represented by a single product in Stitchex, you can link them by entering a different WooCommerce product ID for each Stitchex product variation. If you have an existing product in WooCommerce, you can "link" that product to the matching product in Stitchex. Click the WooCommerce button at the top of the page. Click the "Connect to existing WooCommerce product" link. Paste the WooCommerce product ID into the text field and click "Connect". Stitchex will inspect the product within WooCommerce and try to match the WooCommerce product variants to individual Stitchex SKUs by color and size. If your colors and sizes are named differently within your WooCommerce store, Stitchex won't be able to automatically link them and you'll need to manually select the correct WooCommerce variants using the drop-down menus. If you have multiple WooCommerce products represented by a single product within Stitchex, enter the first WooCommerce product ID using the steps above. Stitchex will link all variations to the first WooCommerce ID, but you'll then be able to update each Stitchex variation with the correct, individual WooCommerce product ID. If you haven't yet added the product to WooCommerce , you can start the process quickly by uploading the product from Stitchex to WooCommerce . This will create add a new product in WooCommerce with the correct product options and variants linked to each SKU within Stitchex. After uploading, you can finish setting up the product in WooCommerce and remove any variants that aren't intended for sale. Click the "Upload product to WooCommerce" link. Within a few seconds, "available to sell from stock" inventory levels will be copied across to your WooCommerce store. During normal operation, changes to inventory will be updated in WooCommerce automatically. 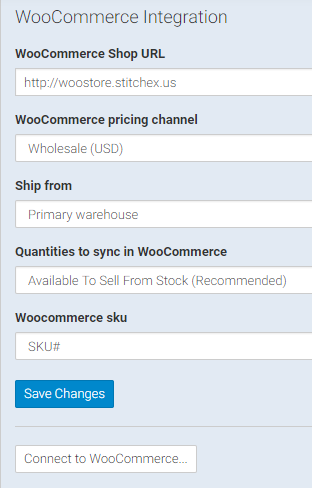 To disable syncing of inventory levels between Stitchex and WooCommerce click the "disconnect" link on the WooCommerce integration settings page. Stitchex remembers how products are linked between Stitchex and WooCommerce so it is safe to disconnect temporarily.